This is particularly striking in the Main Worship Area where the eye is attracted from the floor to the ceiling in the Sanctuary. One climbs up three steps to the site of the action of the liturgy. Moving upward the eyes find the Tabernacle, then the crucifix and three windows with the blue of the morning, yellow of midday, and red of sundown helping us to remember that God is with us at all times. The altar is plain and sturdy, representing Jesus. It is unmovable. 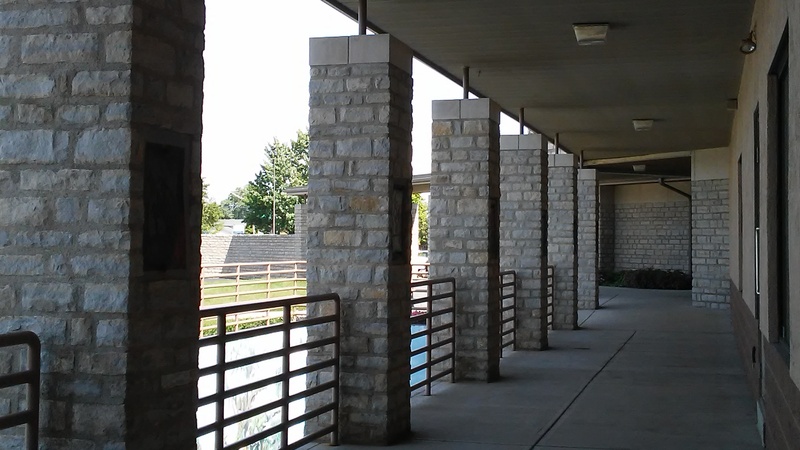 The pillars here and elsewhere in the facility are reminiscent of those in the “little white” church which this one replaced, as is the arch design. 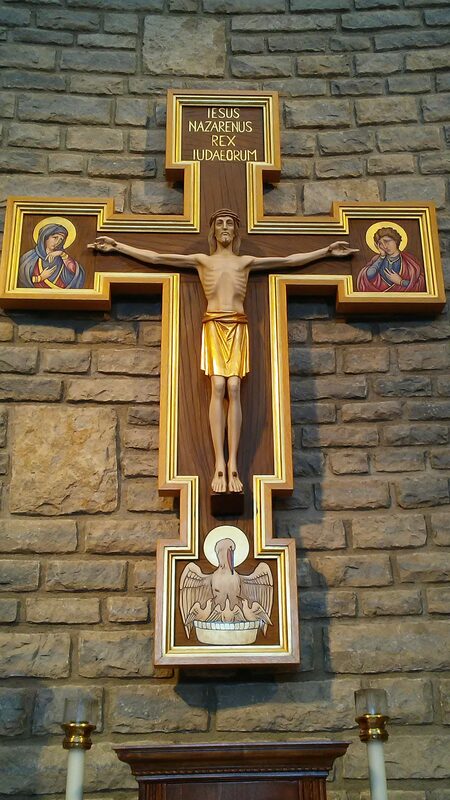 The crucifix is that of the risen Christ with His head high and looking directly at us, arms outstretched as if to embrace us as individuals and a community. His mother and St. John who were with Him at the crucifixion are pictured at either side of His hands; INRI is inscribed above His head. Below His feet is a pelican feeding her young with her own blood, a symbol from early Christianity: Jesus redeeming us with His own blood. The lifting theme is evident throughout the facility, particularly in the design of the windows and the pillars which are raised slightly from the floor. When the space was being discussed, someone commented that “when you have something to say, you step right up and say it.” This became the theme for the ambo from which the Scriptures are proclaimed. The lector/presider/cantor step up on a raised platform to announce God’s Word. The windows in the St. Cecilia Room (former Day Chapel), Shrine (now called the Meditation Room) move from dark to light until disappearing into undefined space. Looking high above the doors between the Gathering Space and the Main Worship Area, one sees the stained glass window of St. Cecilia which was moved from the previous building; it had been donated by then pastor, Fr. Joseph Buzek, and the women’s bowling team at the time in honor of Father’s parents. 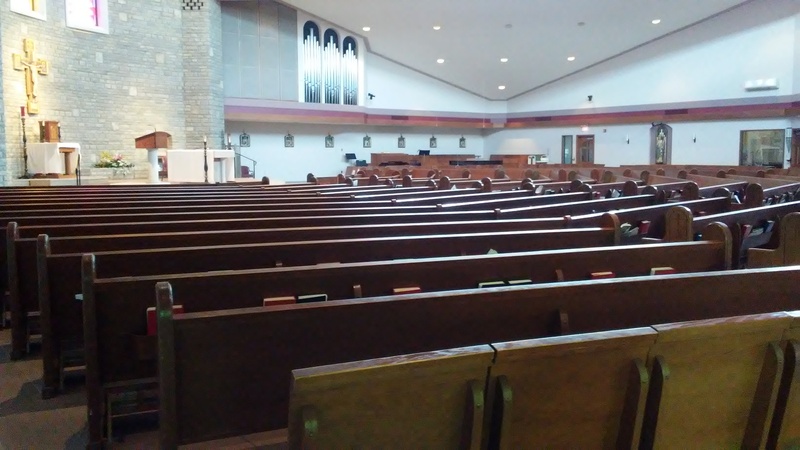 To promote unity and active participation by the entire assembly, the pews are arranged in a semi-circle. The musicians (choir, cantor, instrumentalists) are on the same level and all of the liturgical ministers come forth from the congregation so that the liturgy is one in which all (clergy and laity) engage. One enters the Church through Baptism so the Baptistery is located at the entrance of the Main Worship space. It is in the form of a cross, allowing for Baptism by immersion, particularly adults at the Easter Vigil. The catechumen descends the steps; the priest (or deacon) submerges him/her three times with the words, “I baptize you in the name of the Father,” “… of the Son …,” and “the Holy Spirit.” The individual “dies with Christ” and “rises” sinless to leave the water from the other side. Infants and children are baptized with the water flowing from an upper pool. Tiles with images of fish symbols of Christ and His followers are along the bottom. The Holy Water holders were gifts of parishioners and brothers. Lee and Charlie Meyers, in memory of the Joseph Meyers family, probably in the ‘40s. The Holy Oils are displayed in a lighted niche (called an ambry) in this area: chrism (used in ordinations and Confirmation), sick­ (Sacrament of Anointing), and catechumens (to seek God’s help by adults preparing for Baptism). The oils are blessed by the Bishop at the Chrism Mass on Tuesday of Holy Week and brought to the parish church as part of the Holy Thursday liturgy. "MANY PLACES FOR PRAYER AND MEDITATION"
The Holy Family was selected as the focal point in a shrine (now called the Meditation Room) located off the Main Worship area for private prayer and reflection, with the “Finding in the Temple” as the theme. The bas relief along the wall pictures the Holy Family on their return journey from Jerusalem and they meet up with us on our journeys. The bas relief includes the Scripture passage on this incident (Luke 2). The thought was that parents are particularly challenged as their children approach adolescence and Jesus was about 12 years old at that time. 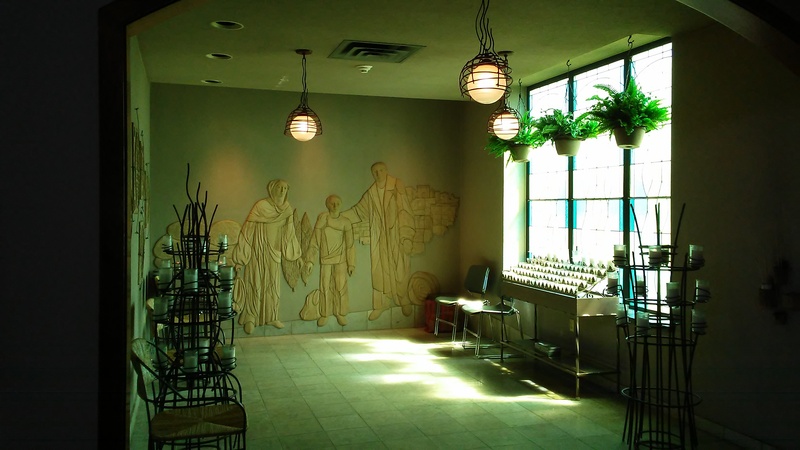 The room is designed as a Mediterranean Garden with wrought iron vigil stands in plantlike and organic shapes entitled “Reed Bundles” and “Burning Bush.” Their upward motions continue the “lifting up” theme of the entire facility, as does the design of the window. 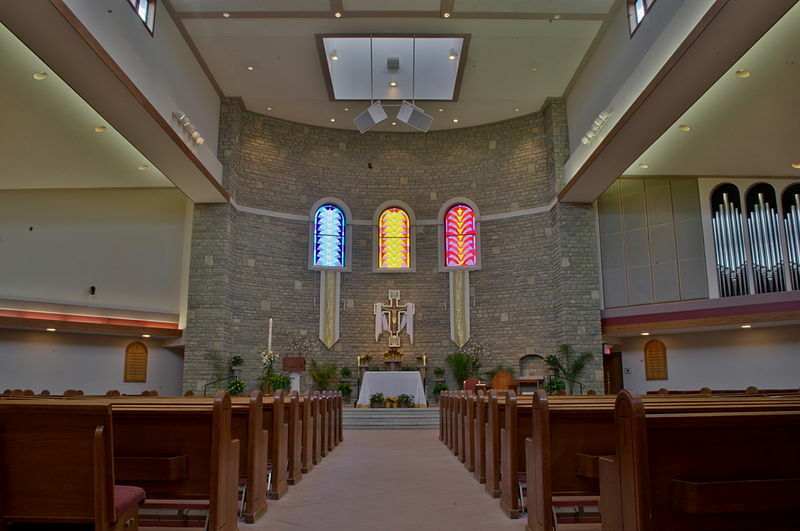 Chairs, rather than kneelers, were chosen to lend a relaxing conversation between the Holy Family and the families of St. Cecilia Parish and add an outdoor effect to the space. Panels of poetry are hung to help the people’s meditations. 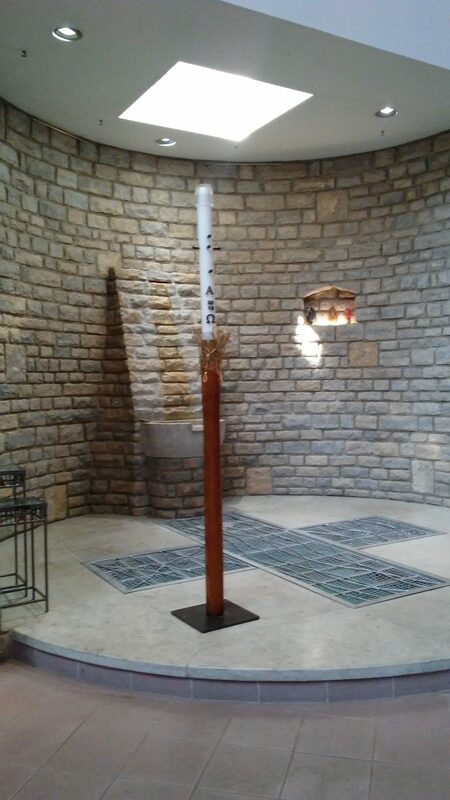 There are three sets of Stations of the Cross: The original ones are along the colonnade outside the southwest side of the building (by the school/rectory) and encourage people to “walk” the Stations themselves. Another set was placed in the Day Chapel (now the St. Cecilia Room) and a few years ago a set of the traditional style was hung in the Main Worship space. People can pray the Stations alone or in community at any time; although a regular communal prayer service is held on the Fridays of Lent. The Gathering Space is more than just a site for transitioning to and from secular and sacred space but also offers an opportunity to form community by not only conversations with other parishioners, but in outreach. Here, to name a few, we can serve the hungry through collections of food for the Westland Food Pantry as well as for Christmas dinners (both of which we share with other churches in the Westland area); help saves lives through Red Cross blood drives; comfort the elderly and sick with shawls accompanied by prayer. The signing up for parish events brings the people together then and during the event. 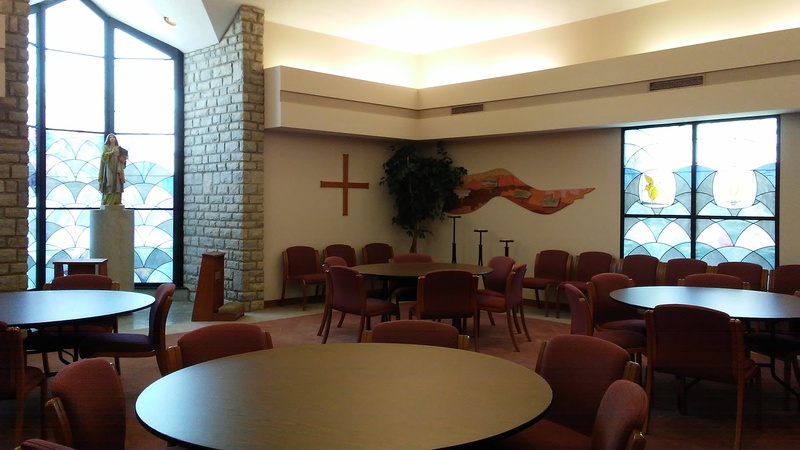 The Gathering Space and the St. Cecilia Room are sites for parish socials after some Masses or prayer services. The names of the donors to the building campaign are listed on a wall hanging. 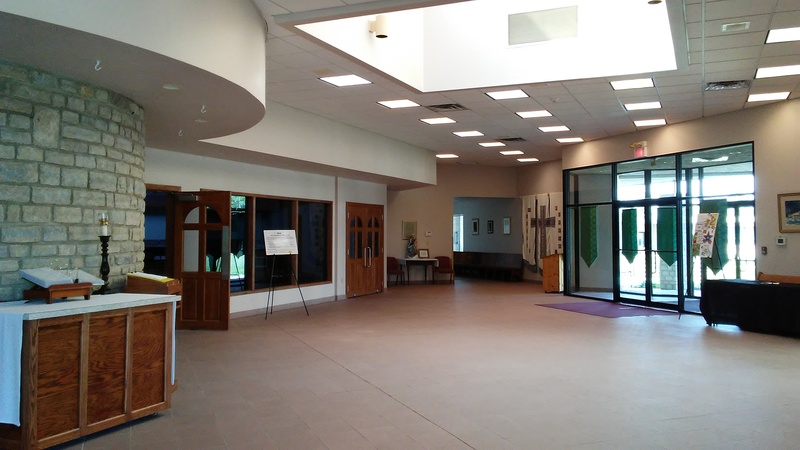 Moving across the Gathering Space is the St. Cecilia Room which was originally the Eucharistic Chapel and the site for weekday Masses, Adoration of the Blessed Sacrament, and other prayer services attracting small groups. Today, it is a meeting room for parish groups, adult and children education, socials following liturgies or prayer services. A Quieting Room is provided for soothing and pacifying infants and young children in preparation for their return to the worshiping community. 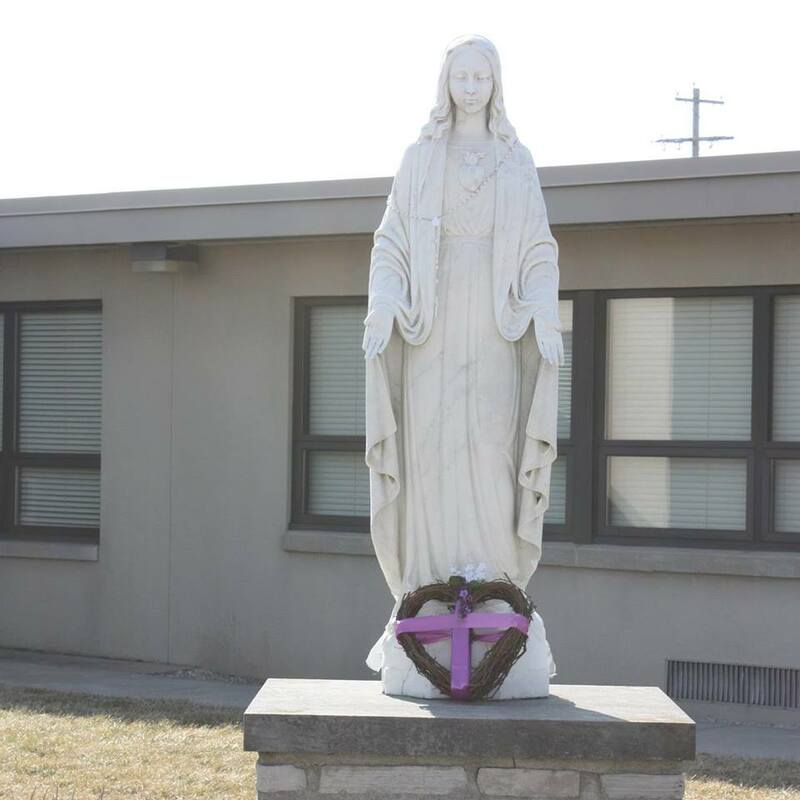 Outdoors, a statue of Mary stands in a courtyard among the buildings (church, school, rectory) and one of St. Cecilia is in a grove on the site of the “little white” church which served the parish from 1934 until the current building was completed. Both were purchased about the time that St. Cecilia School was established (1950s). They are often, but not exclusively, the sites of prayer services by the school children.